Dermot Drummy could dip into the January transfer market to add a defender to his Crawley Town squad. The head coach has revealed that, barring any more injuries before now and the window opening, the back line is the only place in his squad he is considering strengthening. With Matt Harrold making his eagerly-anticipated return from injury, coming off the bench against Bristol Rovers in the FA Cup on Saturday and Dean Cox able to play in the new year, Drummy sees the pair as having the impact of brand-new signings. Drummy said: “Having Matt Harrold back is like a new signing if he stays fit and I have been very impressed with Dean Cox in training. “I have watched him at Burgess Hill and he has a super attitude, he is going to add to the team, add to the experience and add to the feistiness. 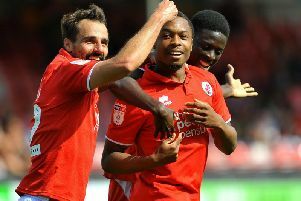 Reds added former players Conor Henderson and Sanchez Watt to their ranks on short-term deals at the start of the month, but both must earn a longer stay at the club. The 25-year-olds are currently with the club until November 15 and are expected to play a part against Southampton in the Checkatrade Trophy tonight (Wednesday) and the Sussex Senior Cup next week - which has now been postponed due to the FA Cup replay. That could see their trials extended, but Drummy has admitted neither ex-Arsenal youngsters are a shoe-in for a permanent deal. He said: “I will decide on Watt and Henderson and they know that. They are here to get fit and here for an opportunity.